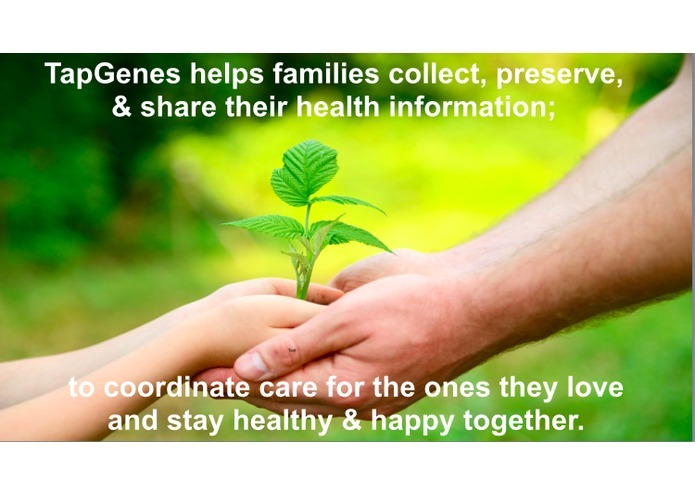 Personalized health through genealogy, health histories, & genetics to help families minimize risks & live well. Heather was inspired to start TapGenes when her father fell critically ill. She experienced first hand the challenges and fears of coordinating care for an ill loved one and navigating the healthcare system. Convinced there had to be a better way to convey health information in a crisis and to also make something meaningful out of it for loved ones in everyday life, Heather developed TapGenes with the mission to help families everywhere care for the ones they love & preserve critical health information for the future. What does the phrase "it runs in my family" mean to you? Is it your grandmother's diabetes? Or your father's heart disease? Or perhaps your sister and mother who both battled breast cancer? 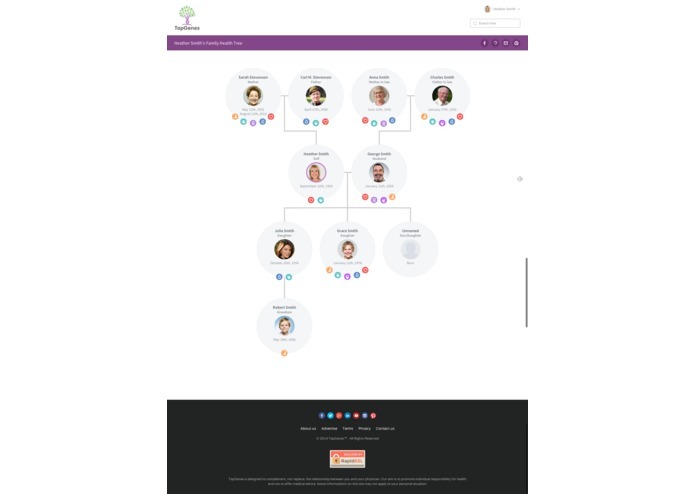 TapGenes connects the dots between your family, your lifestyle, and your health by combining health records with genealogy; motivating families to manage and prevent health risks and make healthier choices together. 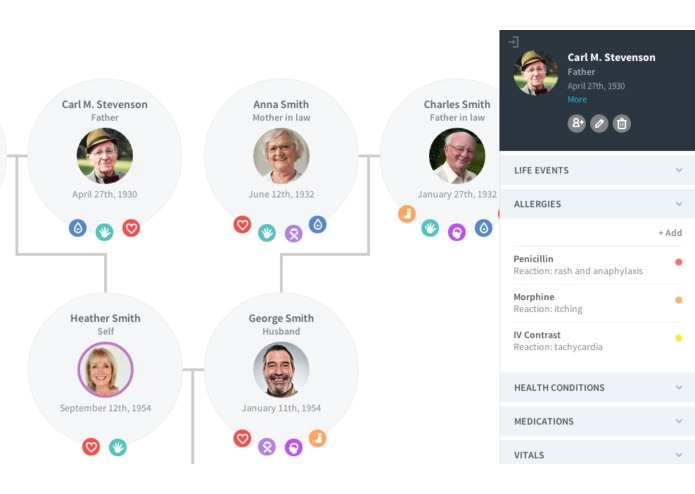 By creating a safe and secure place to manage and care for family, TapGenes helps families have the right information immediately available about a loved one. Whether it’s an unexpected call from the school nurse about a child’s food allergy, a question regarding your ailing mother’s medication while at the pharmacy, or to simply be more prepared for your next doctor’s appointment. The #3 killer in the U.S. is not a disease. And it’s 100% preventable. The #3 killer is preventible medical errors. On top of that, family caregivers are unable to efficiently and easily coordinate care when a loved one is ill. Almost 60% of caregivers report feeling helpless and nearly half of all caregivers admit it is difficult to find practical information to help guide them in their role, whether it is new to them or has evolved with their loved one's condition. Secondary Problem: People have, at best, a partial understanding of their own health risks because they do not know or understand their family health histories. 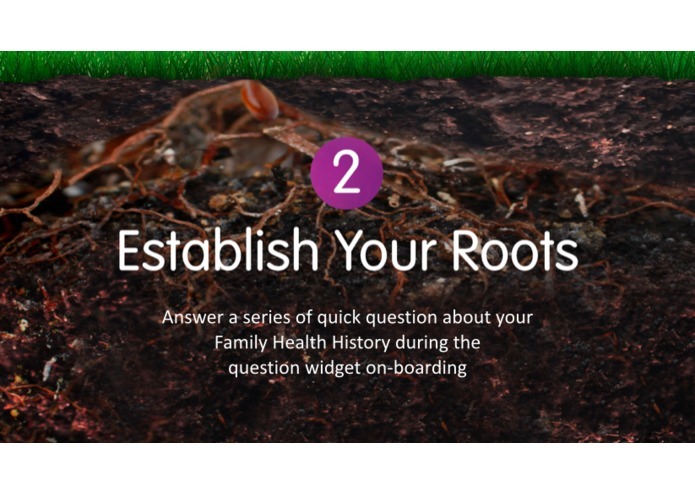 Without understanding where you come from and your family's shared health risks you are missing out on key information that can help you & your loved ones live healthier lives and minimize potential risks together. What if we helped families and individuals gain the knowledge and skills they really needed to better manage and prevent shared health risks within their own family? 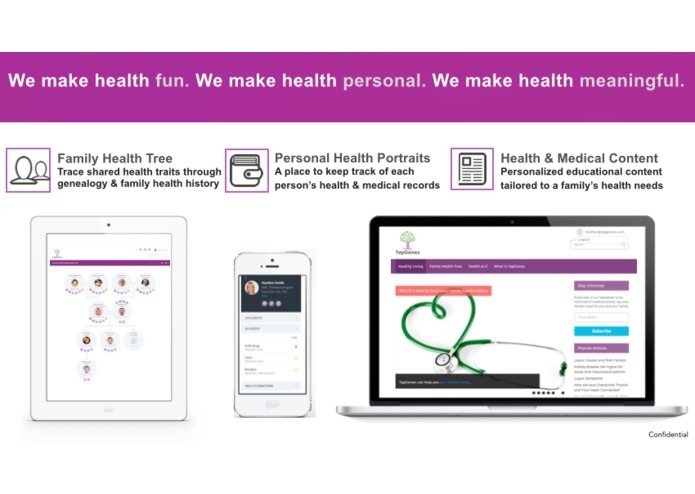 TapGenes is a place for families to collect and share their health information together for the purpose of personalizing health and coordinating care for the ones they love. 1. 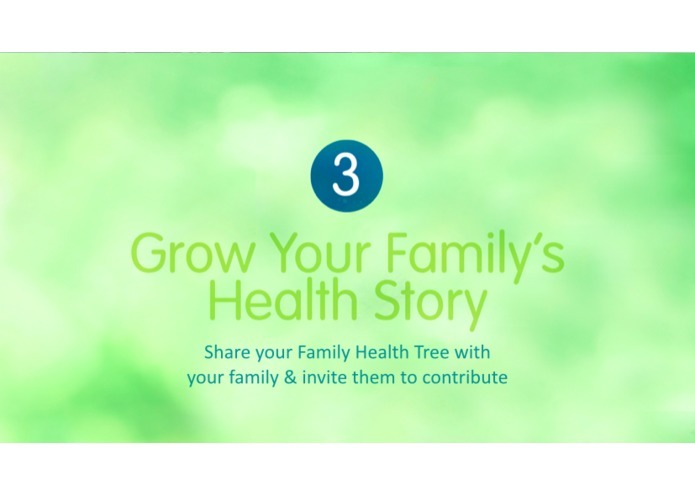 Family Health Trees Creating a visual family health story by combining genealogy, genetics, and your family's health history. 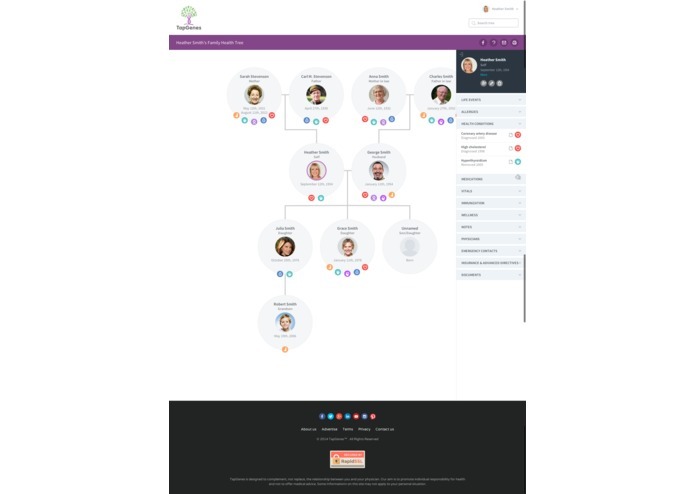 TapGenes turns that information into a family healty tree with icons representing each family member's health conditions clearly visible on the tree for easy identification of shared health traits. 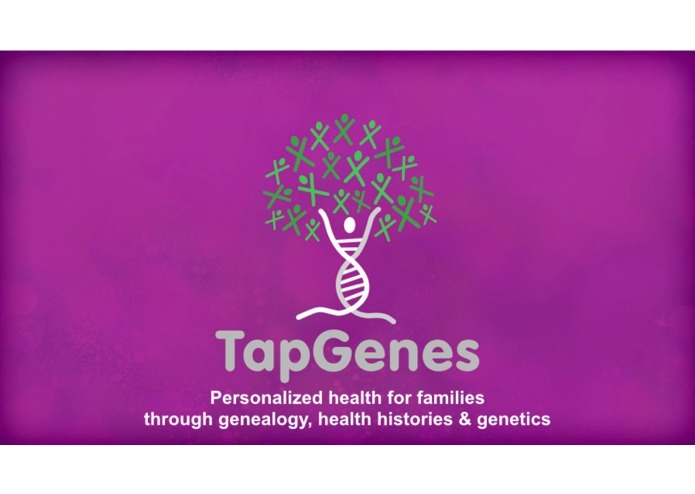 TapGenes can also provide members with their own health risk report card based on their family health information. 2. 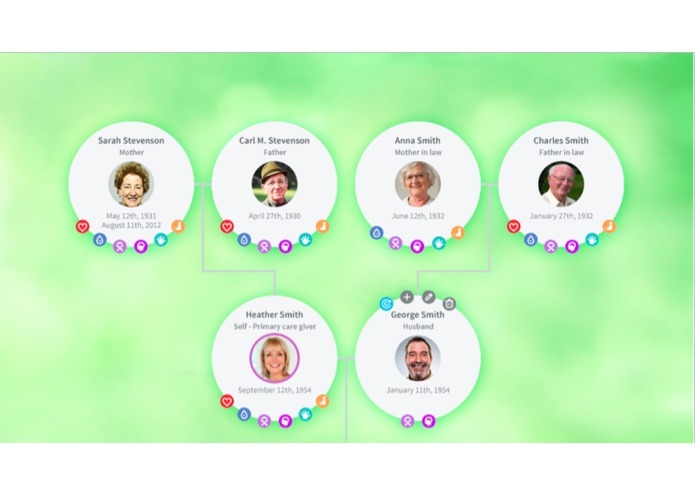 Personal Health Portraits (also known as Personal Health Records) Each person on a family's tree has their own place to save medical information & track their their health. 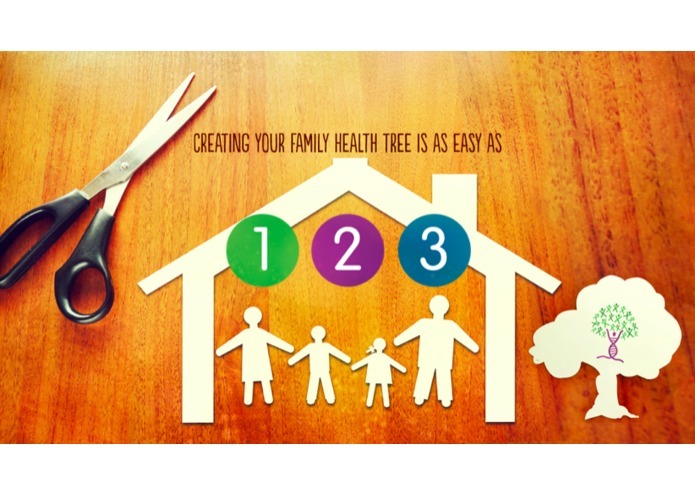 This is a place to preserve valuable health information that may impact other family members. 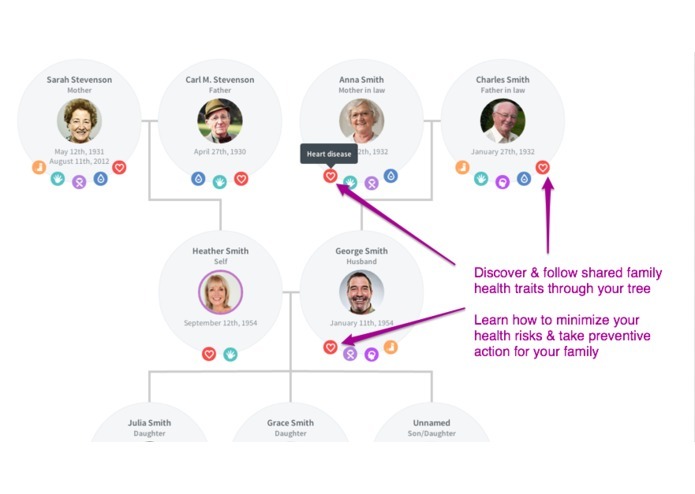 Each family member can have control over what health information is shared about them and who it is shared with. 3. Health Content Over 500 original health articles written by physicians, nurses, health educators, and personal stories from caregivers. 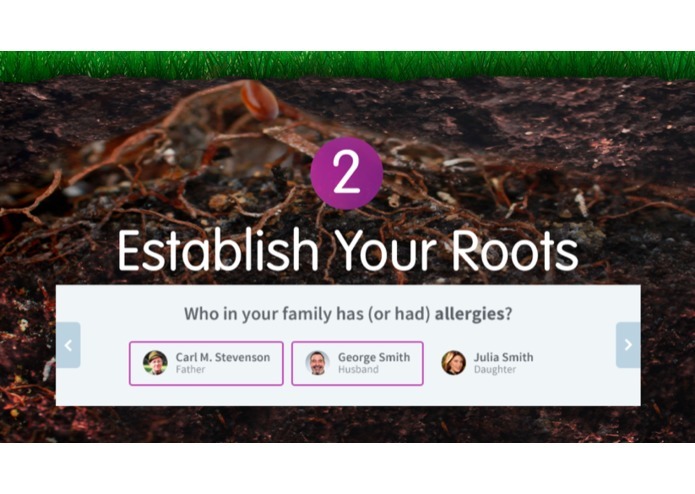 Learn about health topics relevant to you and your family and discover the latest research and tips about how to manage and prevent illiness. Our target customers are “sandwich generation” women caring for children & parents, who may also be financially dependent on them. Almost 60% of caregivers report feeling helpless, isolated, confused and alone. There are 85 millions moms in the US and our beachhead are mothers who are 30-44 years old (36 million in US). This is one of the fastest growing segments for new mothers, & also a life point where a woman's own parents are starting to have their own health issues. Mothers make most of the family’s purchasing decisions; women account for 85% of consumer purchases (including 80% of health care decisions). This demographic is highly active online, and are especially interested in social media and blogs. 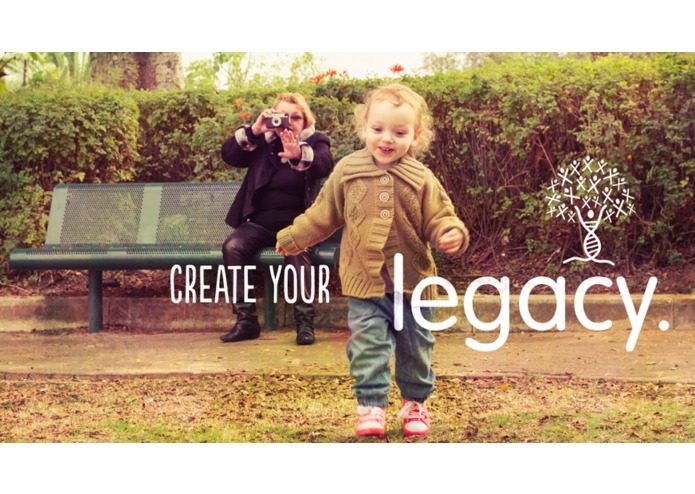 Ninety percent of mothers are online, and of these, over 60% regularly read blogs. With an aging population, 29% of the US population are informal caregivers, spending $243 billion per year on care products and related services. Meanwhile, medical professional time is increasing in expense and scarcity at an alarming rate. There is a consumer revolution in healthcare. However, most traditional consumer health companies have not taken advantage of this shift in consumer needs. Consumers want faster, easier, self-service ways to manage and improve their health—a trend that will continue to increase. 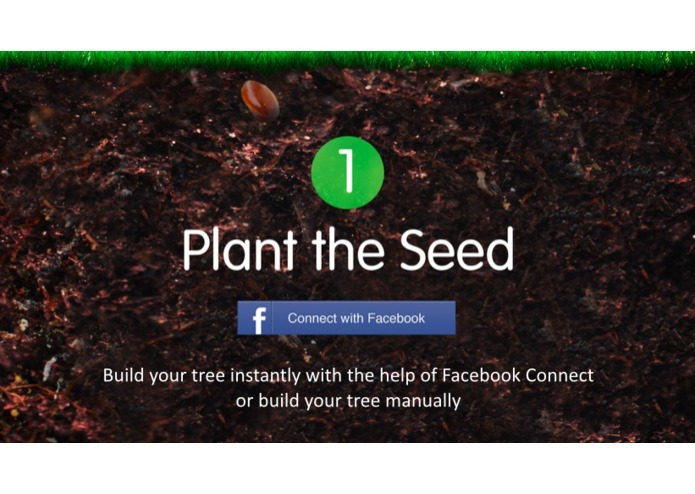 By 2017, it is estimated that 1.7 billion smartphones and tablets will have an m-health app installed. Today, consumers want solutions that allow them to take charge of their own health, and to be an informed stakeholder in their health decisions. This growth will be driven primarily by preventive health and wellness categories and the growing wealth of emerging market consumers. 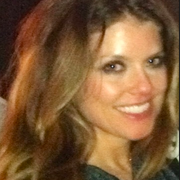 Heather was previously the Global Market Development Senior Manager at Medtronic. Prior to that she was a Senior Clinical Sales Specialist (Abbott Vascular), sales manager (Terumo Interventional) and a television reporter (WLNS CBS). Her expertise is global healthcare, market expansion & implementation (BRIC & Frontier countries), growth strategist for developed markets. Emily was most recently a Health Content Scientist at 23andMe before joining TapGenes. Prior to 23andMe, she a postdoctoral researcher in computational genetics at the Stanford Medical School and received her PhD from Stanford in theoretical chemistry. Her expertise in scientific literature evaluation, algorithm design and programming, statistics and probability, product strategy, and health communication.